This adorable Fourth of July craft is easy to make and will look so cute in your home this summer! 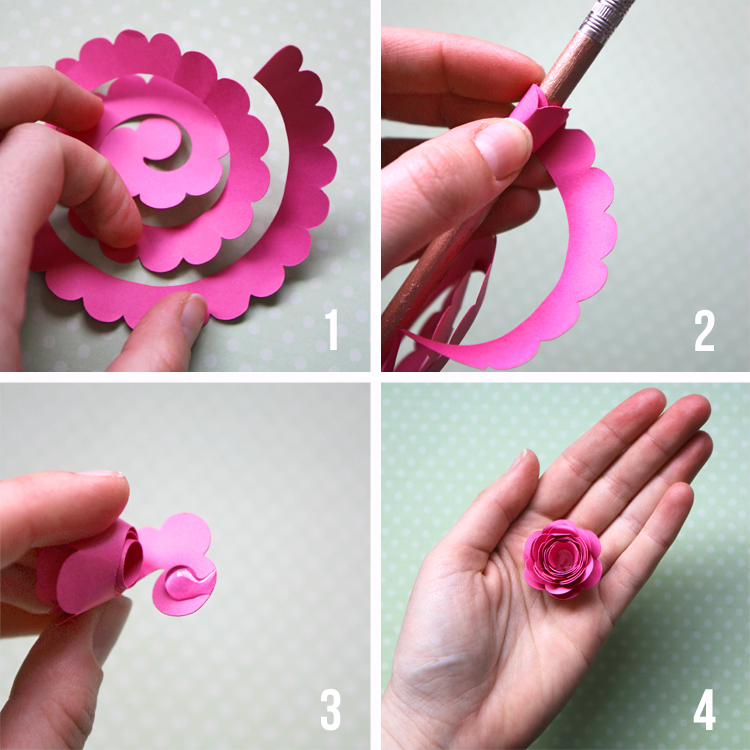 Plus learn how to make rolled paper flowers. I know it’s a still a little early for patriotic crafts, but I finished up this cute DIY pallet wood sign and couldn’t wait to share it with you! My justification is that Memorial Day is just a few weeks away, so if you make it now, you can use it for that and the Fourth of July. The best part about this craft is that I bought the pallet sign already made and all I had to do was paint it. Talk about a time saver! Want to make a sign of your very own? Let’s do it! 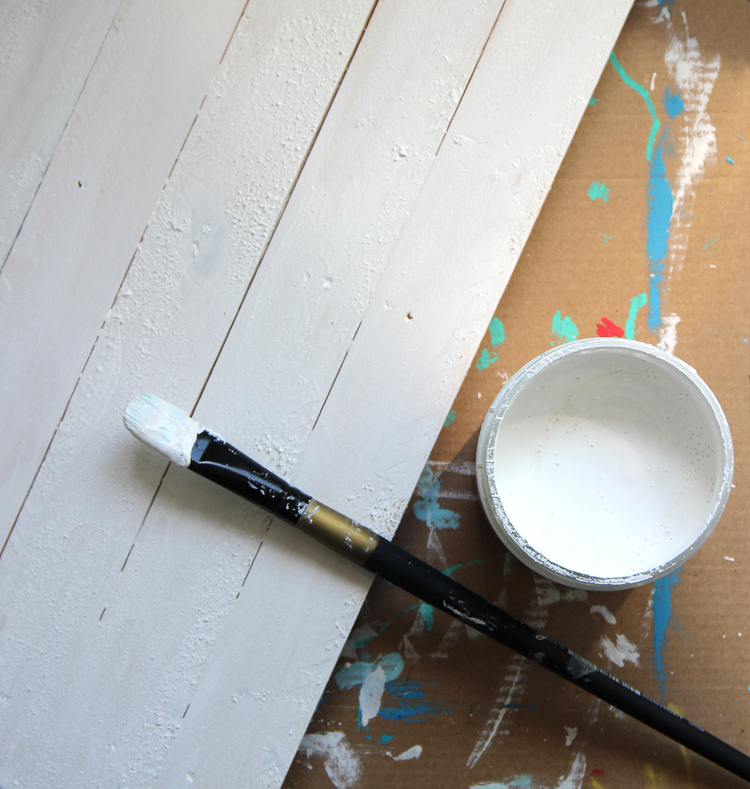 Step 1 Paint the pallet sign with a coat of chalk paint. One coat will give you a subtle whitewashed look. Two coats will give you full coverage. 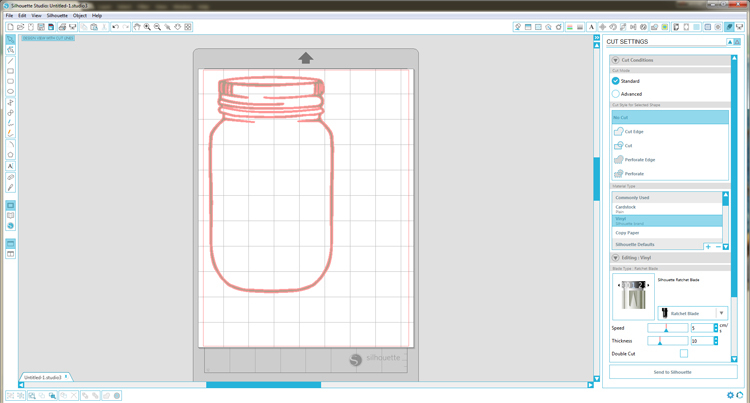 Step 2 Download the mason jar cut file from the Silhouette Design Store. 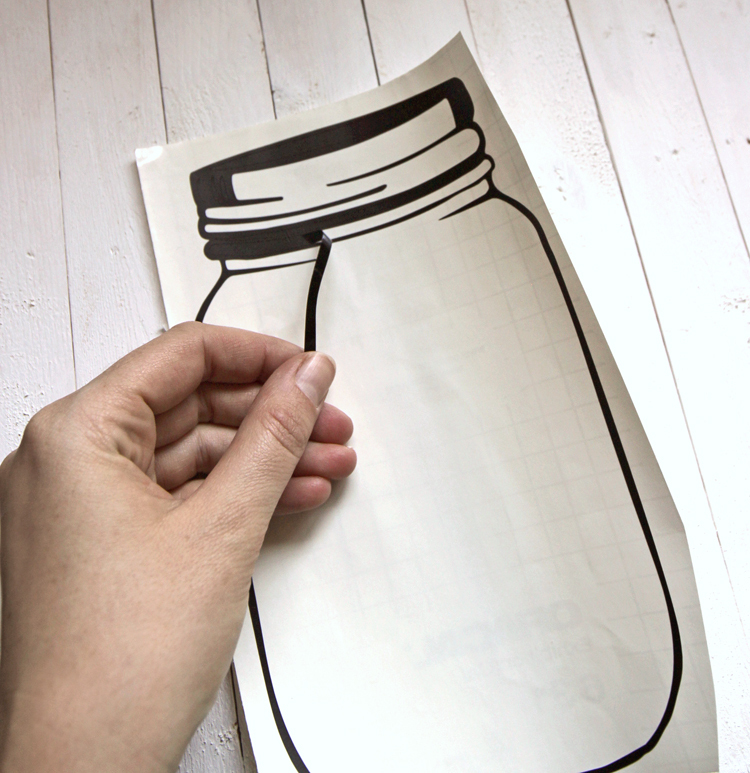 Remove the extra pieces, leaving just the dark outline of the jar. Resize the image so it’s approximately 9 inches tall, then adjust your cut settings for vinyl. Cut out the vinyl. Step 3 Weed excess vinyl, leaving only the jar design on the backing paper. Step 4 Cover the design with transfer tape and peel away the paper backing. 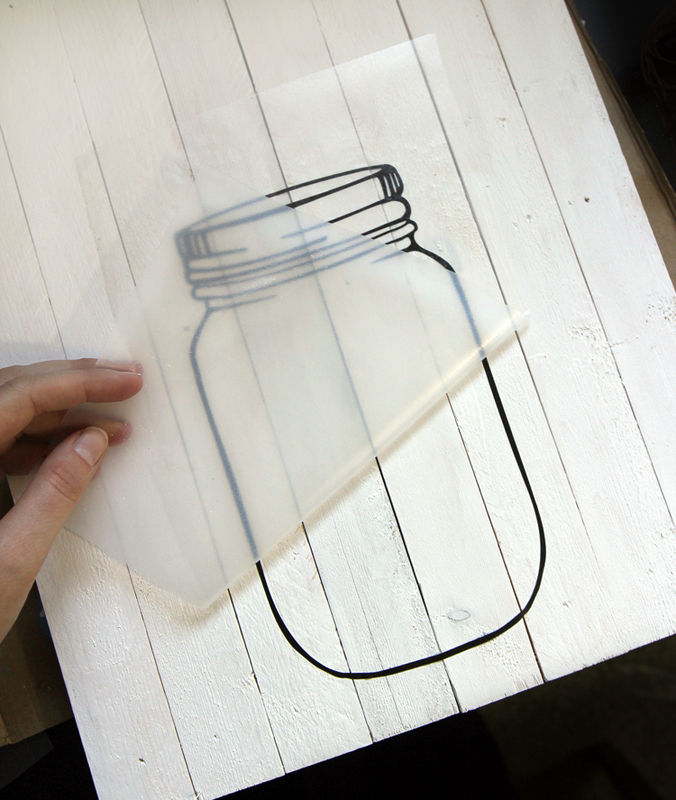 Center the jar on the pallet sign, press the design on really well, then remove the transfer tape. Step 5 Time to make all of the paper flowers! Download the designs in the materials list above, adjust your cut settings for cardstock, then cut out flowers of varying sizes and shapes. Step 6 To make each flower, wrap the outer end of the spiral around a pencil, then roll the paper up towards the center. Be sure to keep the flat bottom edge even as you wrap. The center of the spiral will be the bottom of your flower. Cover it with hot glue, then press the rolled flower petals onto the center. Step 7 Add a bow and the word “U.S.A.” to your jar. Cut the word out of the same vinyl used for the jar and apply it in the same way. I created the word in Silhouette’s Design Studio. The font is called KG Eyes Wide Open. 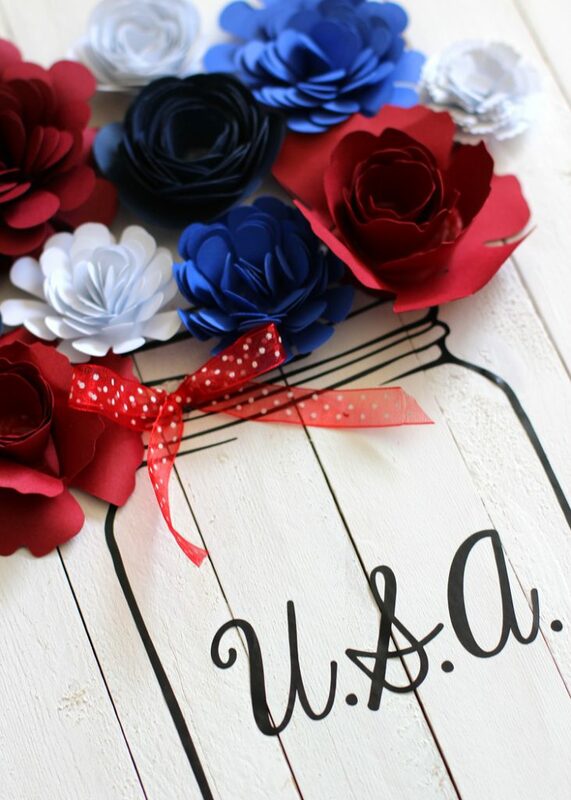 I chose to give this sign a patriotic theme, but if you changed the color of the flowers and put a different word on the jar, it could work for any holiday or season. It’s a fun, versatile craft that’s just oozing with cuteness. Love this! I keep saying I'm going to do flowers but haven't yet. Thanks for sharing! I love this! I'm new to the Silhouette world. Is there anyway you can give me for measurements? Thank you so much! Welcome Patti! You are going to LOVE making things with your Silhouette. SO many fun possibilities! I'm not sure I understand what measurements you want… the size of the board? How to change sizes in the Silhouete software? I'm sorry. I wasn't sure about the sizes of flowers. I bought supplies last night and I'm now ready to cut the flowers. Try making the spiral shapes about 7 inches at their biggest point. Cut one, then you can adjust the size afterwards.